Editor’s note: This the first in a series leading up to National Purple Heart Day on Aug. 7. 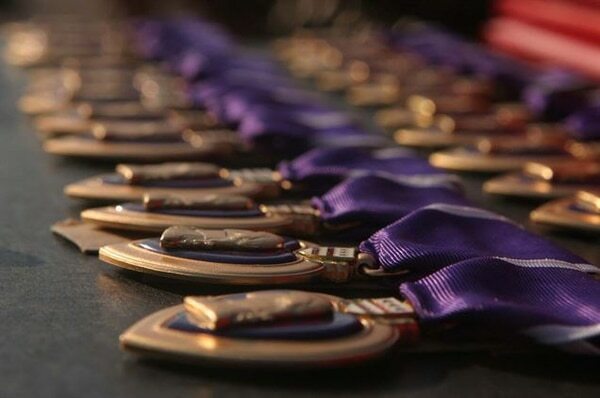 On that day, Purple Hearts Reunited will return lost medals to eight military families. The ceremony will take place at Federal Hall in New York City, the same location where George Washington was sworn in as our nation’s first president on April 30, 1789. A native of Santa Barbara, Calif., Snow enlisted in the U.S. Army Air Corps on Oct. 6, 1942 and served as a B-17 Ball Turret Gunner with the 366th Bomber Squadron, 305th Bomber Group. 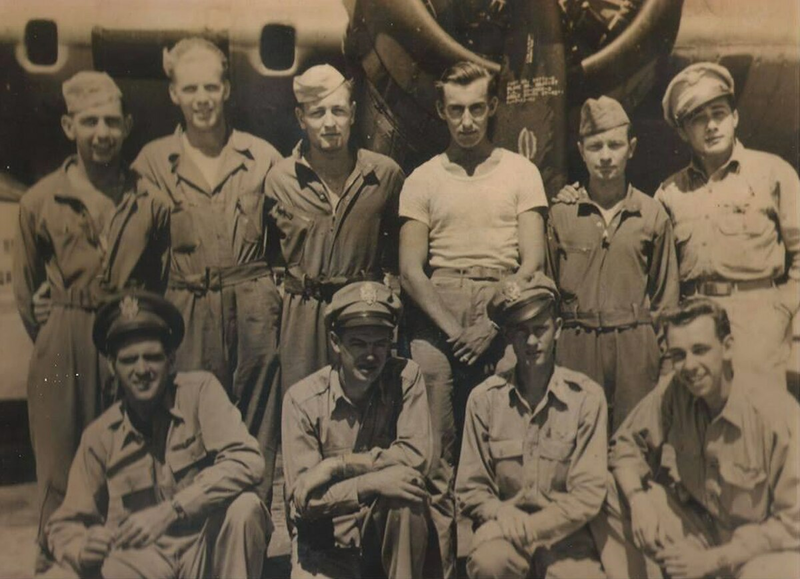 On Oct. 14, 1943, his B-17, nick-named “Mr. Jones,” was shot down by a German fighter near Hoorn, Holland. Their mission was a bombing run on a Ball Bearing Factory in Schweinfurt, Germany. Bernard bailed from the aircraft from the rear hatch and safely parachuted to the ground, however, he was captured by the Germans and sent to several German Prisoner of War Camps, to include Stalag Luft 3 in Sagan-Silesia, Bavaria, Nurembert-Langwasser 49-11, and later Stalag 17B. Bernard was liberated from the camp on June 14, 1945 and released from service on Oct. 6, 1945. Snow’s medals and decorations consist of the Purple Heart, Prisoner of War Medal, Good Conduct Medal, European-African-Middle Eastern Campaign Medal, WWII Victory Medal, and Aircraft Gunner Wings. He lived a good life, marrying Nessia Rebecca O’Driscoll. They had a daughter, Rebecca Violet. Snow died on Nov. 5, 1981. On Aug. 7, his Purple Heart will be reunited with this daughter, Rebecca Crofts, from Superior, Wisconsin. About Purple Hearts Reunited: This nonprofit foundation that returns medals of valor to veterans or their families in order to honor their sacrifice to the nation. Since its beginning, the organization has returned over 350 lost medals, traveled over 100,000 miles, visited over 42 States, and has directly affected the lives of 100,000 people. They were also recently highlighted on the popular History Channel Show American Pickers. Learn more about Purple Hearts Reunited, which returns medals at no cost to the families. About the Purple Heart: The original Purple Heart, designated as the Badge of Military Merit, was established by George Washington – then the commander-in-chief of the Continental Army – by order from his Newburgh, New York headquarters on Aug. 7, 1782. The Badge of Military Merit was only awarded to three Revolutionary War soldiers by Gen. George Washington himself. Gen. Washington authorized his subordinate officers to issue Badges of Merit as appropriate. Although never abolished, the award of the badge was not proposed again officially until after World War I. Gen. Douglas MacArthur, confidentially reopened work of a new design and by Executive Order of the President of the United States, the Purple Heart was revived on the 200th Anniversary of George Washington’s birth, out of respect to his memory and military achievements, by War Department General Order No. 3, dated Feb. 22, 1932. Today, the Purple Heart is a United States military decoration awarded in the name of the President to those wounded or killed while serving, on or after April 5, 1917. An estimated 1.8 Million Purple Hearts have been awarded in our nation’s history. Today, in addition to being awarded to those who fight overseas, the Purple Heart is also given to military personal who display bravery and valor as prisoners of war and while fighting certain types of domestic terrorism. Tony leads a team of more than 30 editors, reporters and videographers dedicated to covering the news that affects service members and their families. Tony is responsible for strategy of the Military Times digital brands, the print publications, video and multimedia projects for Army Times, Navy Times, Air Force Times and Marine Corps Times.